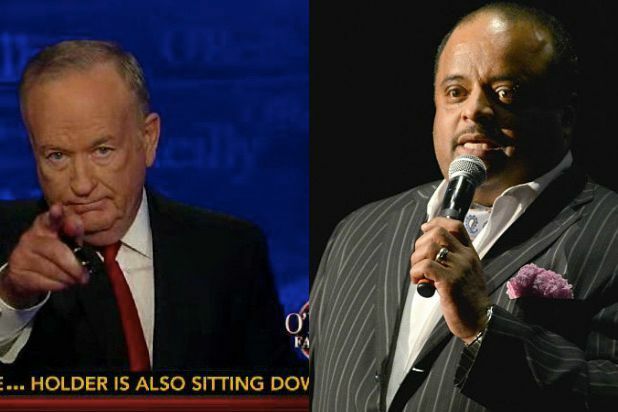 “All kind of folks are criticizing Black Lives Matter, chief among them Bill O’Reilly at Fox News; that is the subject of tonight’s talking points memo,” Martin said, spoofing O’Reilly’s opening show segment. Martin went on to propose a new slogan for the No. 1-rated cable news network. “Fox News loves to say they are ‘Fair and Balanced'; the reality is Fox News really should be focused on ‘Ignore and Deny Reality,'” Martin said. He took on O’Reilly, playing clip after clip that demonstrated what he perceived to be unfair coverage of the Black Lives Matter movement. Martin also called out the Fox News star for not dedicating coverage to police brutality toward African-Americans yet being quick to declare a war on cops over recent violence toward police. “How about actually doing some research?” he asked O’Reilly. Martin took it up a notch, accusing O’Reilly of deliberately lying to his audience. “You do not want to tell the truth about Black Lives Matter; you desire to purposely mislead your audience,” he said. An insider told TheWrap that Martin’s producers have been in touch with O’Reilly’s producers, but O’Reilly has not accepted Martin’s challenge to book him for his show. O’Reilly wasn’t the only one to receive Martin’s angry wrath: CNN’s Don Lemon also got called out. Hey @jonathanwald, can you get @donlemon some new researchers? What he said last night about #BlackLivesMatter is an abomination.